I have now visited Mt Bethungra about six times now with the last five being by 4wd vehicle. The first time I was silly enough to walk it with a couple of others, a repeater, antenna and car battery in tow. Now if you have passed Mt Bethungra – its off to the right just as you cross the railway line between Bethungra village and Cootamundra on the Olympic way, you will realise it is a very large and steep hill. That was back in the 1980’s when I was young and a lot fitter than I am today. As I remember it, it was cold, wet and foggy. Why did we do it? 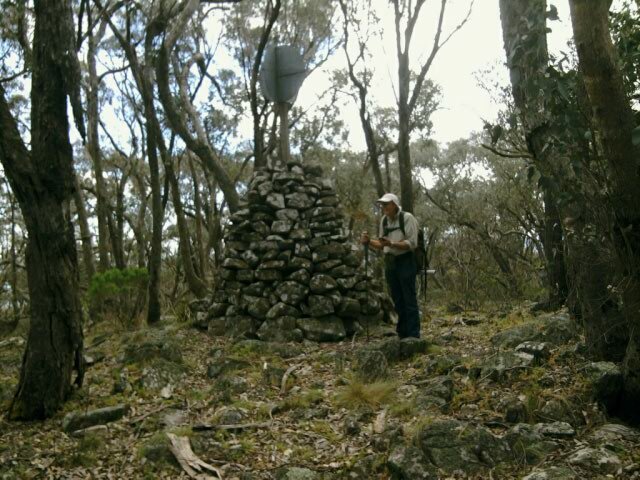 We were testing Mt Bethungra as a site for the then South West Amateur Radio Society. The Society is now defunct and move forward thirty years and Wagga Amateur Radio Club now has the site as home to VK2RBE – a solar operated repeater site linked to 5 others covering the greater part of the Riverina. You can now drive to the top but its a low range 4WD trip up a rocky and sometimes slippery track. Not to be attempted after rain. But its a trip I thoroughly enjoy and look forward to doing – anytime. I might add its on private property and access can only be got by phoning the owner. I picked Jeff up at around 8.40 on Wednesday 23rd October – a day where the Blue Mountains were slowly turning black and where they were they were expecting high winds and even higher temperatures whilst out here on the edge of the southern tablelands we were expecting rain and overcast and cool conditions. Perfect weather for doing this sort of thing. In fact we got no rain but it was relatively cool and overcast. In Melbourne on the other hand it was raining and cold. We live in a country full of extremes! When we arrived at the gate into the property there was a guy in front of us going in who turned out to be a surveyor for ARTC and was about to go looking for old survey pegs as the road was being widened in the area of the railway crossing just down the road and so we helped him access the lock and he went on his way and we went ours – up. As I said, I love the climb and the Troopy didn’t disappoint me as it crawled up in 2nd gear low range doing a mere 1400 RPM. It takes about 15 minutes to do the drive and like many of the summits the view is terrific. I parked a short distance from the towers and we loaded up and set off northwards along the ridge. Saw a few roos disappearing down the side of the ridge line but didnt see any other wildlife after that. I have often seen goats up here but none today. We set up a couple of hundred metres from the car in a bit of a clearing and using a rock for the operating table got stuck into it. You may remember I had misgivings about my little home made antenna tuner. Well, since Wheel of Fortune I had a little time to further investigate and found the main problem. However, I also found that despite fixing it the match to the antenna still left a bit to be desired. Jeff VK2XD came to the party with a small commercial unit for me to try and boy did that work well in the back yard. So I set about connecting it up, hoping to repeat the performance. Imagine my horror when I discovered that the short interconnecting coax cable was missing from my bag. Hell, without it we weren’t going to get on air. I found that problem right after I self spotted on the SOTA website saying I was almost operational. (I use the Rucksack Radio Tool App for this) I mean I couldn’t even use a bit of fencing wire to fix this problem! OK, so, did I have a spare back int he vehicle? I hoped so and set off to see. About ten minutes later I was back with the required cable – phew! that was a relief. It would have been a very embarrassing moment if we had to leave without at least fulfilling one of the goals – the main one! Note to self – Use a checklist the night before and put the spare back in the car. Finally at about 10.30 am (2333 UTC) I put out the first call and Ed VK2JI on the central coast boomed back in to me with a 5×8 signal. From then on and through the next 16 contacts I knew the tuner and antenna combination were working a treat. 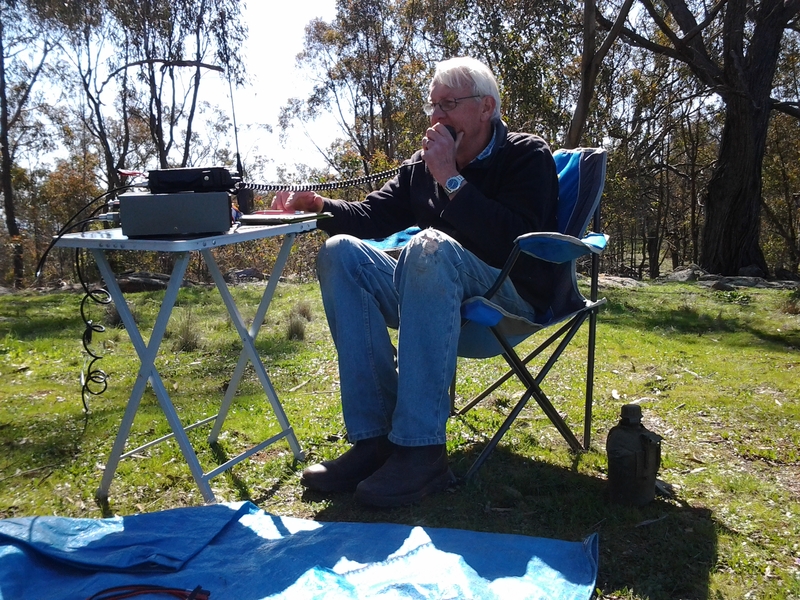 A quite memorable contact was down to Perrin VK3XPT who was portable in his backyard in Melbourne running on a portable magnetic loop. I have worked Perrin before from home using a digital mode on 2M from home (WSPR) and have heard him running 20mW so it was great to work him again using flea power on HF and I even managed to work Paul VK5PAS just outside Adelaide – a distance of nearly 800km, all on just 5Watts of power. I told Paul I hadn’t seen any signs of wombat poo on the rocks up here. He was quite intrigued by that observation which I made and told him about during a contact with him on a SOTA activation earlier in the year and we often laugh about it now. He had seen plenty of wombats but no poo on rocks. If you don’t believe they do poo on rocks, check out anywhere in Womargama Nat Park and its also common right throughout Kosciusko Nat Park. But I digress. After waiting for the UTC day rollover at 11am I then went on and worked some of the same guys again as they get double chaser points and when I had exhausted them it was time to try some higher bands to see what else was on offer. I quickly tuned up to 10.135 Mhz and put out a call and was immediately rewarded with better signal reports from Ed VK2JI, Perrin VK3XPT and Bernard VK3AMB. After again exhausting contacts here I changed up to 14Mz without success noting that VK6MB was listening for me. That would have been fun …flea power into Western Australia. Finally, there is a challenge on making contacts on 24Mhz so we switched up there and put out some calls but without success. So at about 11.20 we packed up and headed back to the car and then drove up to VK2RBE to check on the batteries. It was very gratifying to see that the batteries were in exactly the condition we left them in six months before so it looks like we may have fixed THAT problem. Footnote – Mike VK6MB did hear me faintly on 24Mhz but no contact. Then it was back down the hill. Did I mention I like this drive? The troopy just slowly picked its way down the hill in 2nd and 1st low range. One of the nice things about Bethungra village is the Old School House coffee shop. I can thoroughly recommend it for its coffee, food and delightful owners. So, (plug, plug) if you are planning a run up the Olympic way time it to drop in here, you wont be disappointed. OK, now I am happy with the portable setup but will re-visit my little tuner now I know I can get the antenna to match very well. In fact it seems to match every band from 40m and up. Not sure of my next summit but I am thinking Mt Burngoogee which could also end up being a full day and maybe into the evening but thats for another story. 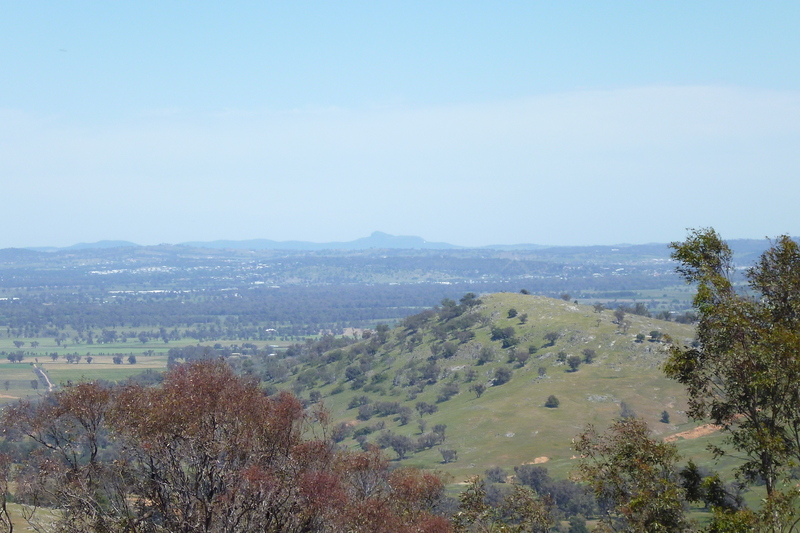 Below are a couple of pictures – in the second one you can just see the Mt Ulandra TV tower in the background. This entry was posted in Uncategorized on October 23, 2013 by vk2yw. Hmmm – OK so its a play on words and no, I didn’t find my real (Wheel) fortune but had fun anyway. The 13th of October was truly a lovely day and certainly too good to be inside so I packed my trusty back pack (well …it was mostly packed the night before) and set off to a hilltop (summit) near Wagga Wagga known to as Wheel Of Fortune (WOF). I have no idea where the name comes from but if you travel from Wagga to Oura you will see Wheel of Fortune Rd running off to the left. Unfortunately, you cant get to the summit along that road but have to go a somewhat longer route to the north and then swing back south once on the ridge. I have no doubt that with permission you probably could go up that road. Anyway, access is via a lane off Pattersons Road that does a steady climb up to the ridge that WOF is on. This ridge extends roughly north from the river for some 20 odd kilometres toward Junee so unless you know where to look its just another line of hills that make up the Murrumbidge river valley. In January it became known in the news as the Valema fire near Oura when a lot of the southern ridge was burnt almost down to Oura village. The view from here is something else. I could easily pick out Mt Galore, Mt Flakney, probably Mt Burngoogee but it was a bit hazy that way, Mt Bethungra and Mt Ulandra in a nearly 300 degree arc and whilst the distance was a little hazy it was well worth the drive up just for the view. The site is home to a number of radio transmitters including Wagga’s 93 FM which sits atop a 300 foot tower. I parked the truck near the 93 FM building which also houses our own VK2RWG repeater and which our club also looks after the grounds and was therefore another reason for visiting – to see the state of the grounds. And yes they would require another working bee to clean them up but that would be another day. I loaded my pack onto my back, grabbed the squid pole (portable mast) and hiking /walking pole and set off. I wanted to get as far as I could along the ridge to distance myself from the 10Kwatt Transmitter because even though it was 86Mhz above my operating frequency I just new I would cop some interference and I wasn’t wrong! I even had to relocate my wire part way through the morning to put it end on to the 93 FM tower to minimise the interference. Next time I will set up just below the ridge line but still within the 25 vertical metre SOTA activation zone. After erecting the squid pole and 1/2 size G5 antenna and homebrew antenna tuner I fired up the little 5W transceiver (FT-817) and put out a call. Instantly I was rewarded with Ian VK3DET about 30km south of Ballarat. He was the first of 19 contacts I made that morning including 6 summit to summit contacts. Contacts were had into Canberra, across NSW and down into Vic as far as Melbourne. By now I have had the experience of three separate summit activations using the same equipment, namely Yaesu FT-817 transceiver, 1/2 size G5RV antenna on a 9m squid pole with open wire line all the way to my little home made antenna coupler. But the operation of the tuner just didn’t seem quite right. Yes, granted I was making contacts but people were struggling to hear me. I just knew it should be better and was determined to look further into it to see if I could get to the bottom of the nagging feeling I had that everything in the garden was not quite rosy. Note to self for next week to investigate. Where to next? Well this was an easy summit no doubt about it but it was only worth one point. It was however great to earn the summit to summit points so my haul for today was 1 activator point and 49 summit to summit points so a tidy and worthwhile point score. My next foray will be to Mt Bethungra. Thats the hilltop you pass on the left hand side when you head up the Olympic Way and cross the railway line between Bethungra and Cootamundra. Mt Ulandra, another designated summit is off to the right butis full of TV and radio Transmitters …not sure I will have a go at that one as the interference will be heavy and access might be difficult! There was one interesting fact on this activation and that was that I actually commenced the activation on Saturday Universal Time Co-ordinated (UTC) and continued through to the Sunday UTC. Now, so what I hear you say? Well for an activator, you can only activate a summit once per UTC calendar year but as a Chaser you can work a summit and get points every UTC day. But to log it on the website that way means you have to log it twice, once for each UTC day. Anyway, I didn’t and was soon receiving emails asking me to re-log because the chasers weren’t able to confirm their contacts with me because they were all logged on the Saturday UTC and they worked me on the Sunday UTC. So back on the website, delete the initial log and re-enter it as two activations ..of which I can only claim one lot of points. Next time I will do it as two logs up front and no hassle. Just a good thing there were only nineteen. UTC by the way is very handy when dealing with international timezones. You dont have to worry about what time it is in outer Botswana as long as everyone works in UTC it’s simple. Here is my view toward The Rock and below is the more important view of the 1/2 size G5 erected on the 9m Squidpole with 93FM in background. This entry was posted in SOTA Activations on October 23, 2013 by vk2yw. Most of my blogs will be abut my SOTA hilltop activations but if I feel the need to write about other aspects of Ham Radio you will find them here. This entry was posted in Uncategorized on October 10, 2013 by vk2yw. Monday of the long weekend dawned looking very nice – yes I was up at dawn. Not that it is such a big deal as it seems the older I get the more likely it is I will wake up at first light. I had spent most of yesterday ( Sunday) checking my gear for this attempt and as a result of my checking I actually rebuilt my wire antenna as my previous attempt I didn’t think was going to ‘cut it’. In the process I dragged out my old bush walking back pack which I thought would be good to load radio, battery, antenna, food etc into. I was a little surprised that it had aged almost as much as me! It wasn’t quite in the condition I thought I had left it in some nearly 30 years ago. But it did look like it would hold together for this trip and so in went the radio, antenna, hammer, pen and paper log, clock, food, first aid kit, portable shelter in case of bad weather and a small extra wind jacket. Additional equipment was a small chair in case I had no operating table or just to sit on (two uses 🙂 ) and finally, the 9metre squid pole and mounting hardware which is what the hammer is for. Had to finish packing before the NRL Grand Final started – which I did – just! Also had to quickly learn how to use the Etrex 10 I purchased on Saturday morning. This was going to be my primary navigation tool. Great little unit about the size of a Silva compass but exceedingly more useful. I uploaded my waypoints and route to follow during Sunday . I had the Samsung Tablet as main back up and a Silva Compass. Just before 7.30am I threw in some food and water and headed off and picked up Jeff VK2XD – my best mate and old bush walking partner and then we headed down to Holbrook and …the bakery for coffee and morning tea. He brought coffee in a thermos for later but more importantly he had thought to print off a bit of the 1:25k – thought it could come in handy! In hindsight I should have just had takeaway coffee at Holbrook as my estimated time to operate from Mt Tipperary was 11am local time but as it turned out it was closer to midday before we started operating. Now fortunately, Bernard VK2IB had been out in the area the day before activating some of the summits and after talking with him during his activation he promised he would email me with any useful details …like how to get into the Womargama National Park for one. If he hadn’t, we would have spent a lot of time just finding the entrance. Seems that the National Parks Service should spend some more of your tax money (I don’t pay tax anymore 🙂 ) on this park and put up some entrance signs on the Jinjellic road but then I suppose more people would go and we wouldn’t want that would we? After all it is a ‘national’ park. Please excuse my cynicism but I am not a fan of the NPWS and their policies of locking up our national parks and other restrictive practices and not just in NSW. I did note signs on the Womargama side on the way out so they obviously had SOME money! Mind you, that entrance to the park is a long way (if you are walking ) from Womargama so unless you were actually going there you wouldn’t know where the park was. Come to think of it, I didnt even know it was a National Park …thought it was still Dora Dora State Forest. But I digress. Moving on, and following Bernard’s advice, we found the entrance and drove on in. If you need to know and go then the entrance simply says Ardsley on a green mailbox and obviously takes you past the Ardsley homestead but its all public access …again a sign would be handy. The track was fine but please note you won’t traverse a lot of this area in your commodore – it is 4WD in lots of places and you wouldn’t try too much of it if it has been wet. On my map on the Samsung tablet (Ozi Explorer) this part of the track in just didn’t exist.A couple of ‘k’ in and it rejoins what is Tin Mine Fire Trail and as I mentioned elsewhere – the Hume and Hovell Walking Track. Cute little signs dot the fire trail indicating (presumably) the H & H Walking track. The country all the way along consisted of a lot of loose granite, mostly hidden in calf deep grass and just waiting to trip me up…which it did …did I mention I fell over three times? Well I did. There was also lots of fallen trees that I am sure contained lots of black or brown snakes which we either traversed or climbed over. Fortunately we didn’t see any..snakes that is, in fact, other than a couple of roos and wallabies as we drove in the only other wildlife we saw were parrots or crows. Did I mention how steep it was? Well it was quite steep! My knees and other muscles I had forgotten I ever had are continuing to tell me. 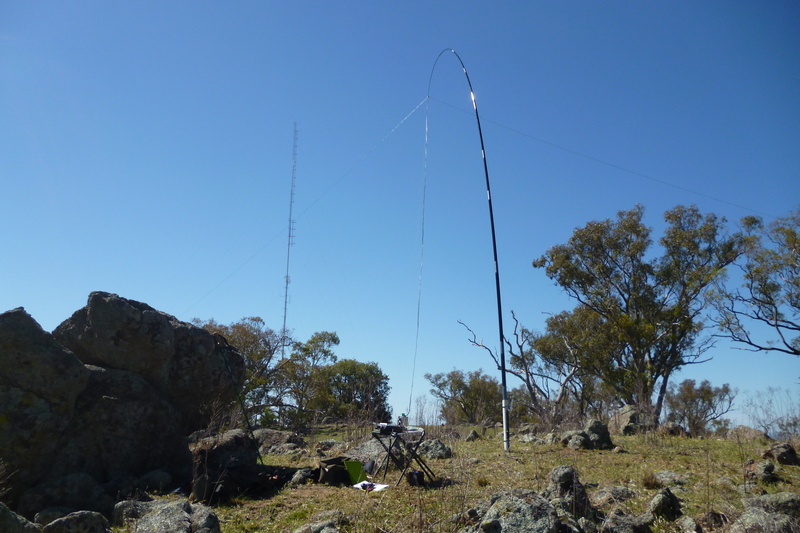 It was just after midday when we reached the summit (see piccy below) so making our ascent almost two hours but, after a few minutes after arriving, we had the squid pole mounted and antenna attached and erectedand the radio operating. Jeff managed my log for me and we went on to make 14 confirmed contacts between 12.20 and 12.45. 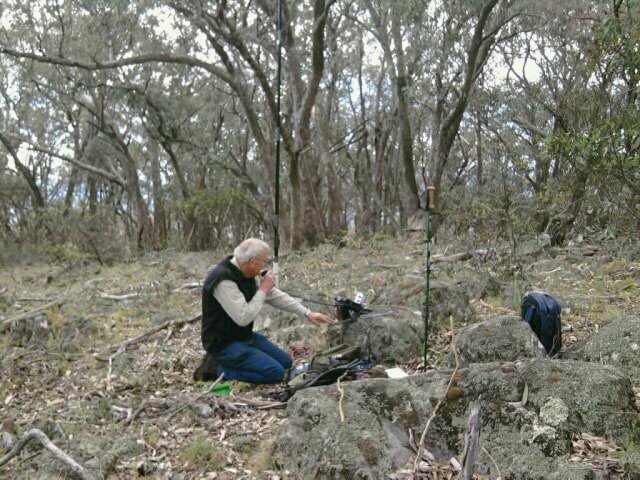 The contacts were made up of ten Victorian stations, two from NSW – well three actually as Ian VK1DI was portable up on Mt Wee Jasper and was my only Summit to Summit contact and a station in Canberra (VK1) . Radio conditions were very variable with stations jumping from Strength 1 or two right up to strength 9 in the course of a minute. Most stations I worked also had similar difficulty with me. I am putting this down to the fact the antenna was in the trees. We finished up with a bite to eat and a quick look around before starting the descent. This time we thought maybe straight down and so I simply entered a ‘go to’ into the little Etrex to head us back to somewhere near the Troopy. Check out this picture. Now, clearly, people in the past, have had a lot of time on their hands. This is a serious cairn of rock close on 3.5metres tall and easily 4metres in diameter. Wikipedia suggests a major geodetic survey was done in the 1970’s so I presume it dates back to then. One has to wonder ..how many people did this? How long did it take? The photo below was my operating position. We did have a look around from the top and what glimpses we got the view was pretty spectacular – the trouble was there were so many trees it was difficult to get anything other than a tiny glimpse. The descent was a little quicker but still took us an hour and twenty minutes. I managed to fall twice on the way down as it was very steep in places. So steep in fact I often went down crab fashion or backwards even. Our navigation worked well as we came out within about 50metres of where we started. And very pleasing the Troopy was where we left it even though we couldn’t see it until the last 50 metres. Love the Etrex – great piece of gear and – dare I say it? An essential piece of bush bashing equipment. I had intended another summit during the day but I am glad we didn’t as my legs I am sure would not have made it. Not sure about Jeff but he didn’t push the point with me to do another so they are still there for another day. I see there are at least a couple of other summits that every bit as challenging as this one plus a few that look like a walk in the park in comparison. Jeff had traveled the Tin Mine track (main track through the park) some years before and as it came out at Womargama I suggested we continue on and have a look at some of the other peaks in the park as well. This track is also part of the Hume and Hovell walking track and crosses some very pretty country. Goodness only knows how Hume and Hovell got on navigating with what they had back then …probably just a compass and no map but at least they were on horseback! Anyway, it was an interesting drive and I did have to engage 4WD a couple of times to cross either creeks or just negotiate rough and rocky ground. About two hours later we came out at Womargama and then it was back to Wagga via Morven and Mangoplah. Got home about 6pm. A great day although I am not sure I will activate that summit again any time soon. 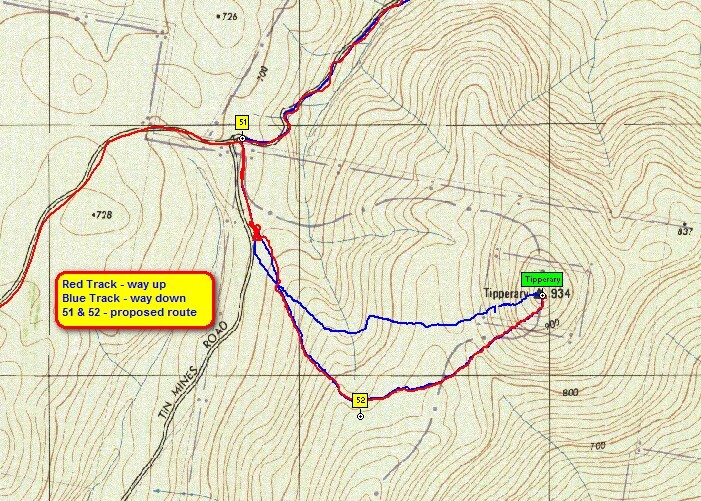 Below is the route we took showing our track up and the slightly different track back. You might note on the blue line where we deviated around a re-entrant … it was just too thick further down it. The red track is from the Samsung tablet which went flat just as we started walking (some back up eh?) and the blue one is the Etrex. The two way points if you can see them were set up the day before. The photos were courtesy of Jeff VK2XD from his little phone. I had hoped to get video from the tablet or at least other photos but forgot to keep it on charge while we were in the car. Note to self – Next time keep the bloody thing on charge and take small camera as backup! John VK2YW – Still Novice SOTA Goat …or just an old goat! This entry was posted in SOTA Activations on October 8, 2013 by vk2yw. SOTA VK2 kicked off much sooner than anyone expected and went live at 0000hrs UTC on Sunday 1st September 2013 – which unfortunately also coincided with Father’s Day. Firstly, what is SOTA? 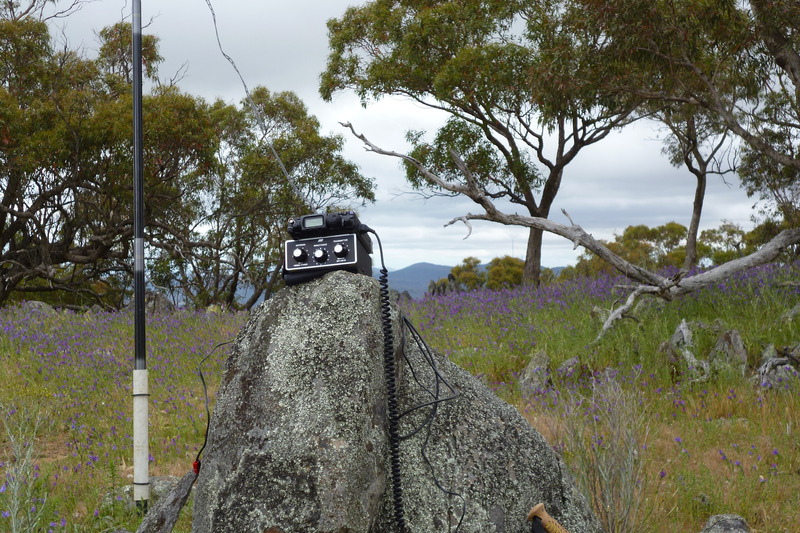 SOTA or Summits on the Air is a relatively new phenomena in Australian Ham Radio circles but it has been around since 2002 when it was launched in the UK. It is an awards program that encourages people to operate portable stations – usually very low power radios and very lightweight antenna systems from specific hill/mountaintops. In Australia, these hilltops must have 150m of vertical prominence all the way around them to comply with the SOTA rules. They are shown on the SOTA website in their mapping tool. The hills are allocated points. There are three categories of the award scheme. Shortwave listener (SWL), Activator and Chaser. The activator is the one who goes and climbs the hill and operates whilst the chaser sits at home and tries to contact them. Likewise the SWL logs both the chaser and activator for points. The main awards are for the Mountain Goat award or the Shack Sloth award. But back to my first activation after all this blog is my record of my activations. I had previously and still continue to do, actively chase the Shack Sloth award and as I write this I have accumulated over 400 points on my way to 1000 but activating is something I really wanted to have a crack at. I didn’t at that stage posses a suitable radio but had my eye on a Yaesu FT-817. Discussions with Neil VK2YZ regarding this and other portable activities led me to borrowing his FT-817 and a couple of LiPo batteries for the activation and I thought I would take my G5RV portable antenna and a tuner. Father’s Day at my house was a very quiet affair …just me, so I thought that would be a great opportunity to set off to the closest designated hilltop to me and that was Mt Flakeny VK2 RI-025. Of course I contacted the owner well in advance and was given the green light to go. I also put up an alert on the SOTA Alerts page. I left home just after 9am and was up on the hill by about 9.45am. I parked about 100m away from my operating position and loaded up with radio, antenna, batteries, groundsheet, small table and a chair and off I set. Must have looked an odd site but there was no-one there to comment. :-). I followed my usual method for erecting the G5 and that was by hurling a sinker attached to fishing line and hand casting reel. I selected my tree and hoped for the best. Bingo! First time. I quickly tied some lightweight cord to the fishing line and hauled the antenna up. I estimated I got the centre about 50′ in the air – plenty of height. Next – get the radio and tuner set up. As I had used an FT 857, the 817 was a breeze to use although since now owning my own I have discovered some of the other features such as built in SWR and voltage readout. But having never used the tuner with this antenna I had a lot of trouble trying to find the best match because as you know, on 40m, the G5 does require a bit of work to match it. Anyway, I settled on what I thought was the best match although on speech peaks it did like to remind me the SWR was high. But, I thought, the proof will be in the pudding – work my 4 stations for the points and anything else will be a bonus. My first contact was with Andrew VK1NAM who was another summit (ST-001) who gave me 5×6 to which I sent a 5×7 as the 817 actually gives you that off the meter. Although if I closed my eyes I would have given him 5×9. 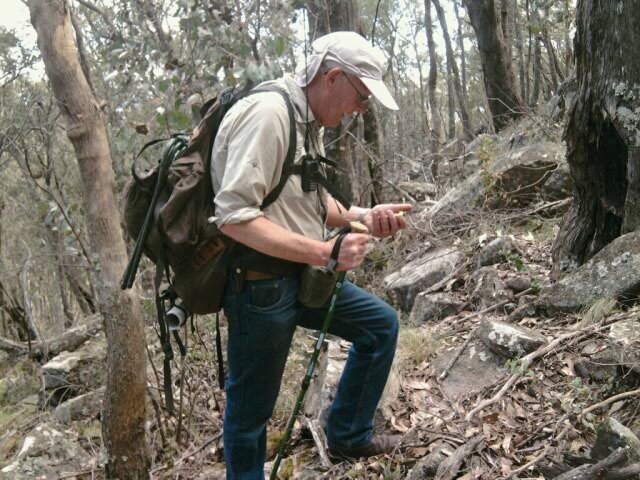 That contact was followed by another summit to summit contact with Alan VK3HRO who was portable on VK3 VC-020 and again received a 5×6 so I was certainly getting out. Contacts 3 and 4 were with Fred VK3JM and Rick VK3KAN/p. Woo hoo! I had my points. I went on and worked another five summit to summits along with another two VK1’s, three VK2’s and nine VK3’s. In my haste to make contacts I inadvertently gave out the wrong SOTA number for the hill. I was giving out VK2RI-026 when it should have been 025. Imagine my embarrassment when I had to post up on the SOTA group my mistake. It seems though that if you dont do that once you havent activated. Seems it is a common mistake and so I don’t feel so bad now. And I think everyone was able to correct their logs. Whilst I was operating, a vehicle arrived on the scene. A chap got out and came over and wanted to know just what I was doing as he was the owner’s brother. After I explained and told him I had permission he replied “Ahh, you’re the radio bloke!” Seems my fame had preceded me. He wandered off in the bush and started collecting wood. The sound of the chainsaw drowned out some of my tranquility. I finished up after about an hour and a half and dropped the antenna, packed up the gear and wandered back to the car. I made it home well and truly before lunch. I learnt that I should make up a properly drawn up log before I go and to ensure I have the correct summit to advise the chasers with. Although in my defense, the summits weren’t up on the database as of that morning – they didn’t appear for a few days and therefore spotting wasn’t an option – had I been able to I would have realised my mistake very quickly because the spotting service gives the summit reference number. All in all, a great day and I even managed a ‘selfie’. My thanks to the following stations for calling me: VK1NAM/p, VK3HRO/p, VK3JM, VK3KAN/p, VK3FPSR, VK1MDC, VK2ONZ/p, VK3YY/qrp, VK3DET, VK3AMB, VK3OHM, VK3MRG, VK3UBY, VK1DI/p2, VK3PF/p, VK2JI/p, VK2LAX/p both on HU-093 and VK3KAB/p. Neil VK2YZ informs me I only used 20% of his LiPo batteries during the activation. Where to next? Well, I am hoping to activate Mt Tipperary – they tell me its a long way! and if I get time there is another one quite close and it is yet unanmed so I may get the honour of naming it myself. John VK2YW – junior SOTA goat – or just an old goat! 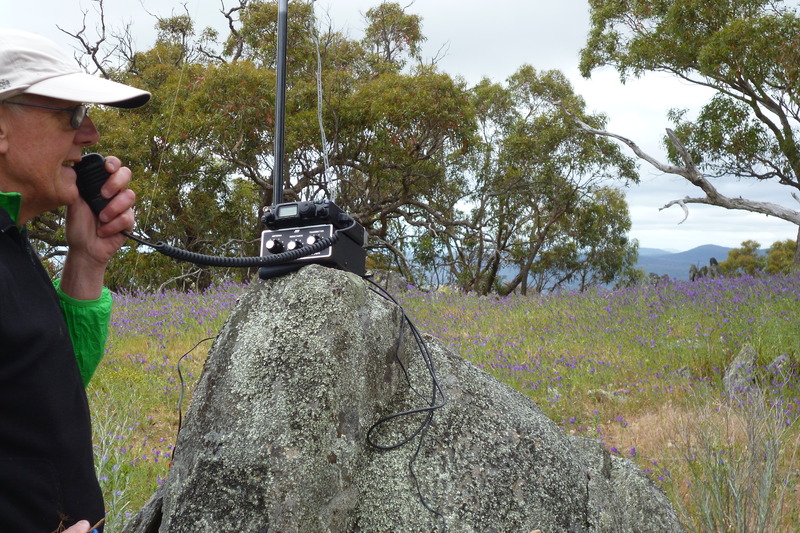 This entry was posted in SOTA Activations and tagged Australia, Coordinated Universal Time, Father's Day, Lithium polymer battery, Mountain Goat, Radio, SOTA, Summits on the Air on October 1, 2013 by vk2yw.